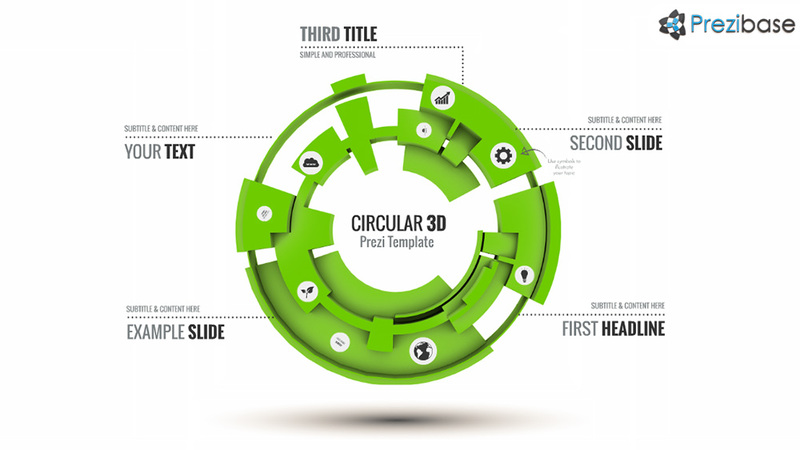 3D Prezi Presentation Template with a futuristic circle concept. Customize the color with 1 click. Create a professional circle infographics presentation or use it for personal topics. Add your own icons that are most suitable for your presentation topic. Use it for creative marketing, talking about your new product/service or introducing your company. A multipurpose template with a simple yet professional look. Talk about the future, forecasts, prognosis, technology, IT or circular process. Use the default Prezi 30 colors, or add your own custom color to the circle via CSS editor. NB: the white background color cannot be changed. This entry was posted in Best Prezi presentation templates and tagged 3-d, 3d, 3d circle, 3d circle presentation, 3d technology presentation, about, add, are, backgound, backgroud, background, backround, business circle template, business presentation, chart, circle, circle professional presentation, circles presentation, circular, colors, data circle, future circle, future circle presentation, futuristic circle, infographic circle, infographic template, pie, presentation circle, professional circle, technology.